As some of Europe's queens and queens consort are beginning to age, they frequently reach for smaller, lighter tiaras. 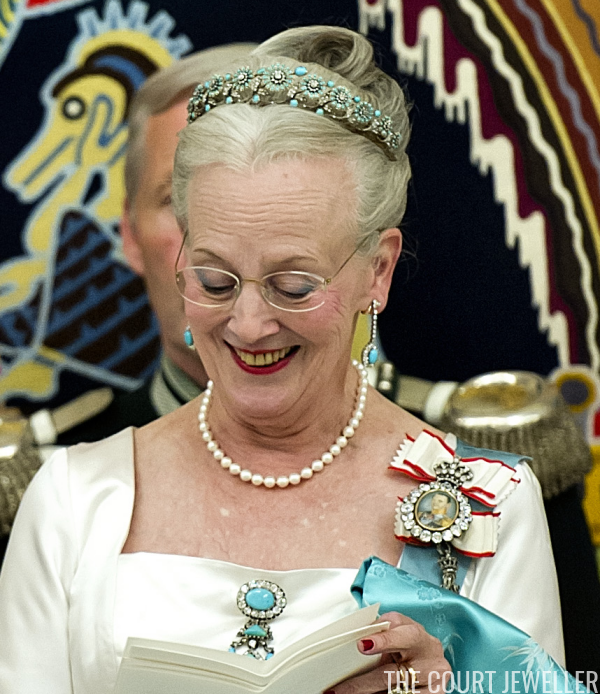 In Denmark, Queen Margrethe II has begun to wear her small turquoise bandeau more often for state banquets and other diplomatic events that require a tiara. I've seen some speculation that the turquoise bandeau may have been a gift to Crown Princess Margareta from her parents, the Duke and Duchess of Connaught. I've also seen it speculated that the turquoises in this older set may be Russian in origin and could even have been owned by members of the imperial family. But, to my knowledge, none of this has been specifically confirmed. I've also never seen a reliable reference to the tiara's maker. According to Bjarne Steen Jensen, the tiara can be removed from its base and worn as a bracelet. He dates the piece to the late nineteenth-century, arguing that the shape of the flowers is typical of the period. We also know that Margrethe began wearing the piece way back in the 1960s (including an important outing during the pre-wedding celebrations for her sister, Queen Anne-Marie of Greece), though she has only started to wear it regularly for events like state banquets within the past decade. Above, she wears the tiara during a state dinner for the Chinese president in 2012. The tiara has also been lent to others on various occasions. It was worn by Crown Princess Martha of Norway (mother of the current king) at the wedding of her sister, Astrid, to King Leopold III of Belgium in 1926. She's the person marked with the yellow #1 in the group photo above. On that occasion, it must have been Martha's cousin, Ingrid, doing the lending. Jensen notes that, at some point, the tiara was also worn by at least one of the Haga princesses (Ingrid's nieces -- the four sisters of King Carl XVI Gustaf of Sweden). In later years, the tiara has been worn by Madeleine Tengbom (maternal grandmother of Prince Richard of Sayn-Wittgenstein-Berleburg, the husband of Princess Benedikte of Denmark) at her grandson's wedding, by both of Princess Benedikte's daughters, and by Princess Theodora of Greece and Denmark at her aunt Margrethe's Ruby Jubilee in 2012.